Can your people leave the collapsing station, avoid the aliens, and make it to safety? Players take a turn by moving crewmember, destroying part of the station, and then moving one of the aliens. Get caught on a destroyed piece or eaten by aliens and your crewmember is no more. Reach one of the escape routes with a crew member to score points. The game is simple to understand, but the fun part comes in using special abilities and simply picking on the other players. A quick conflict-ridden game that allows players to really stick it to their neighbors. 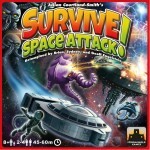 The object of Survive: Space Attack! is to get as many of your 10 crewmembers to the jump points on the four corners of the board. Players earn points for each crew depending on the value (1 to 6 points) on their underside. Players also score one point for each unique jump point used. While the goal is straightforward, completing the task is not. Crew can be eaten by the circling alien predators, die during the final station explosion, or even get sucked into a black hole! The game begins with a central station made out of hexagonal tiles representing cargo, habitat, bridge, or reactor core sections. 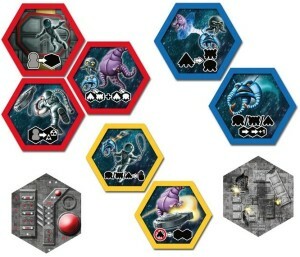 Players are given two escape pod tokens, put all their crewmembers on the station tiles, and an alien queen is placed at each corner of the board (next to the jump points) as well as one queen in the middle of the station. Once placed, players may no longer check point value of their crew members (displayed on their underside.) The space station tiles are slowly removed by players to simulate the station breaking apart. In an interesting twist, each tile also has a special action underneath. This means that every station piece removed gives a player a one-use power for future use. A player’s turn consists of four actions. First, they can (but don’t have to) play a new alien creature onto the board (if they have one on the back of a tile they’ve collected.) Second, they may make three moves. A move consists of moving a crewmember, moving a ship (which may have crewmembers aboard) and firing a laser (if you have a crewmember at a laser location.) There are also tiles that can be spent to give extra and unique actions during this phase, such as swapping two crewmembers, moving alien creatures, even moving ships you do not control. Third, a player removes one of the station tiles and keeps it to use its ability later (some tiles have an immediate effect.) Tiles must be removed in order according to type (so the reactor tiles are last, one of which has the game-ending core breach event.) In a nice use of components, the tiles have varying thickness. The thinner tiles are the first ones to be removed. A player’s last action is to roll the creature die. They may then move one creature of type shown on the die, hopefully with dire consequences to one’s enemies. Meanwhile, there are three creatures roaming the board. Spawn chomp down on any defenseless drifter crewmembers while the warriors focus on eating any ships (fighters or escape pods) they come across. After warriors eat their fill of ships, passengers are left to drift in open space. Queens, on the other hand, rule the board. They will eat any and all crew and ships in a hex. The game runs a balance of teamwork and “take that” mechanics. Do you cooperate to get your escape pod full of crew to the exit, or do you abandon ship and send a queen over to eat the remnants? The unknown (to other players) point value of a player’s crewmembers helps to keep everyone in the game, since the true leader is not ever known. It can also generate some bluffs and double-bluffs as players try to save their high-value people without letting anyone on to their true worth. I like how the game provides variety as the game goes on. 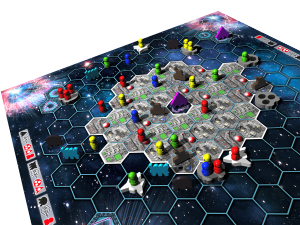 Initially, players and creatures move along rather predictably but, as more station tiles are removed (and aliens are killed) players begin to have more options on their turns. The station tile powers (you never know what is underneath) provide a bit of randomness, but an appropriate amount for a short-ish family game. The main hindrance to family gaming will be the aggressive player vs player interactions. It is a given that you will be hindering other players’ plans. This is either a drawback or a feature of the game, depending on your players. As with all games of this type, things can get quite political as some gamers gang up on others. Come into the game with this expectation and it should be all right. The game starts at an easy pace, but then ramps up in difficulty as the game goes on. However, the complexity of the rules mainly lies with the station tile powers. The rules are fairly clear about their abilities, and some graphic icons help, but a certain level of competence is needed to use the powers to one’s benefit. The slight randomness in the game helps to level out player ability, giving the younger set (particularly if they gang up) a shot at beating out their parents. As for art and theme, the crewmembers are pretty abstract and the aliens are wonderfully cartoonish. The 8+ age range on the box is about right, but I think I would not go much younger. One final note: The game has a 5-6 player expansion and a “Crew Strikes Back” expansion that gives some crew member special abilities. I haven’t been able to try either one, but I’d be slightly wary of a larger game (maybe 5 players) due to increased chaos and game length. However, giving the crew new abilities sounds quite fun.